A major shock was in store for many staff members as they arrived in the staff-hut on the Friday evening. Gone was the ancient and much-loved warped ceiling in the staff lounge (with headache-inducing fluorescent striplights), and in its place was a beautiful pine ceiling, complete with new spotlights. Work on this had been planned for some time, and had been carried out during the week by external contractors who have also recently re-clad the exterior of the hut and also renovated the bedrooms in the Richmond Chalet. Although the centre staff generally like to carry out this type of work themselves in order to keep costs down, a combination of busy activity sessions and memories of Dave's recent attempt to demolish the dividing wall whilst putting up a picture hook led them to seek outside help. 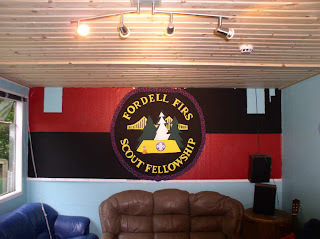 All agreed that it was a major improvement, and plans are underway to decorate the rest of the lounge in due course. After a reasonably busy weekend, Sunday night saw a staff 'open meeting' which allows everyone who is a member of the Fellowship to give their views on all the issues that affect them and the site. These are intended to be held every quarter, and provide an opportunity for members or helpers who are not committee members to have their say on issues. 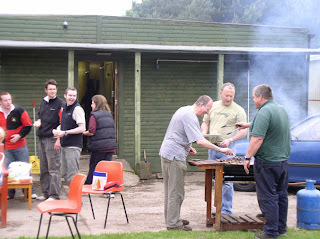 After the meeting, a barbeque was held outside the staffhut, aided by some rather nice weather. 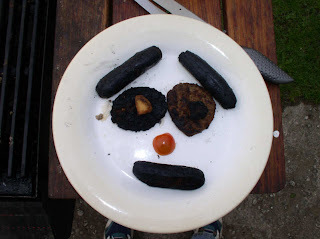 Fine food was enjoyed by all, except for Brian who turned up very late and found that all that remained were a few lumps of hot coal on a plate (see photo). Despite this the evening was a relaxing way to end the weekend and looks likely to feature regularly during the summer.